Adventure is in his blood. You tell him all of the time to be careful, but your child just wants to perform some crazy feats in his free time. He wants to take chances and gamble. He also wants a droid as a best friend and his own spaceship! Just think of all the trouble he could get into hanging out with L3-37 on the Millennium Falcon. Yes, your child is shaping up to be a little Lando Calrissian, just like in Solo: A Star Wars Story. This year, just let him indulge in his more intrepid inclinations! While you might not be able get him a Millennium Falcon or a droid of his own, but you can at least help your child get into the Star Wars groove by dressing him up in the officially licensed costume! 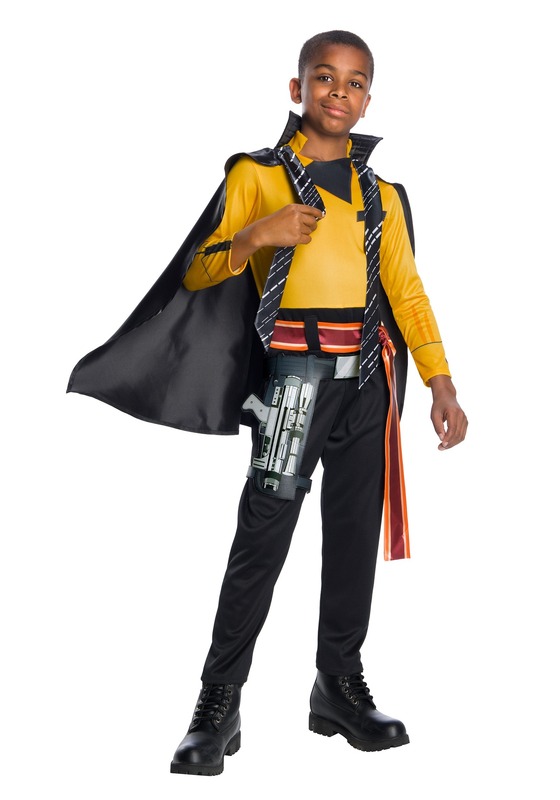 This child Lando Calrissian costume gives your child a look based on his favorite character from the movies. It comes with a full-body jumpsuit that recreates his look from Solo: A Star Wars Story. The top portion is a vibrant yellow color, while the bottoms look like elegant black pants. It also comes with a sash that ties around the waist and a belt with a printed holster that also fits around the waist. Of course, we all know that Lando is one stylish guy, so this costume comes with a flowing cape and a 2 piece scarf that will turn your child into the coolest kid in the galaxy! When your child is all suited up in this Lando Calrissian costume, your child will be ready to head off on his next adventure. Be sure to check out our full selection of Star Wars costumes to join your young one on their next foray into the galaxy!